A bird’s nest is a wonderful addition to a backyard, and these are most common during the nesting season in spring. 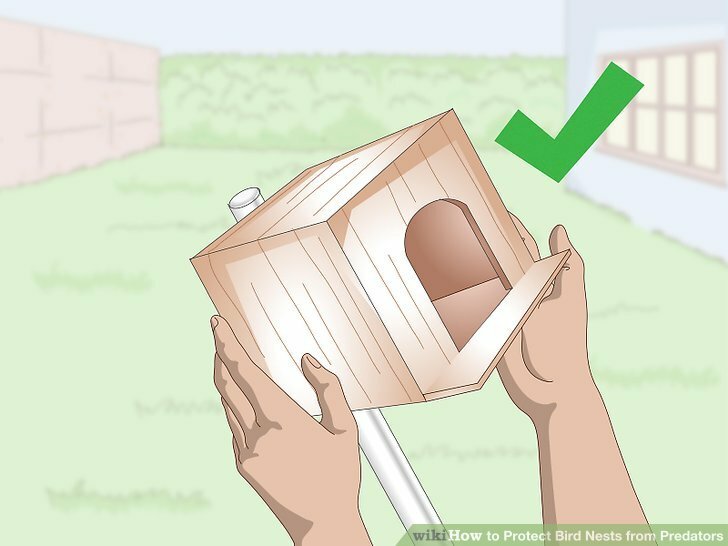 Make it difficult for cats and racoons to reach the nest box through limiting when cats can be outdoors, installing the nest box in a good spot, and attaching a predator guard. For snakes and insects, keeping the area around the nest box maintained, and making sure that the nest box is clean when it's empty is key. Protecting the nest from predators will increase the likelihood of survival for the birds and their chicks, and you will be able to watch many generations thrive in your own backyard. Keep cats indoors during the breeding season. The breeding season for most wild bird species is during the spring, however this can be slightly earlier or later depending on the species. 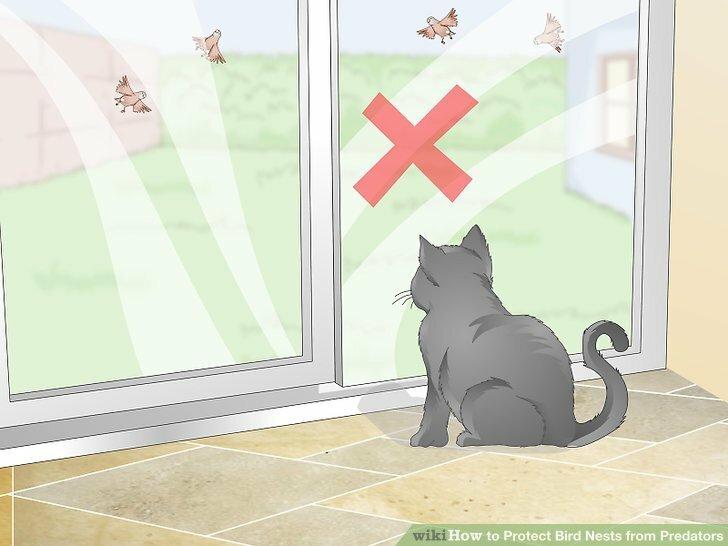 Keeping your own cat indoors, and asking your neighbors to do the same, particularly at night, will help to keep the nest safe from cats. Some further signs of bird breeding season being underway are all of the typical signs that you associate with spring. Blooming flowers, light rain showers, bright plumage and feathers, and an increase in bird song are all signs that the nests will have chicks soon. Put a bell on your cat’s collar if you can’t keep them inside. This will help to warn the birds of an approaching cat. Although a bell will only offer a small amount of protection, it will be helpful in addition to other protection strategies. You can buy bells for cat collars from most department or pet stores. Buy a nest box for the birds. You can get nest boxes from many hardware and gardening stores. 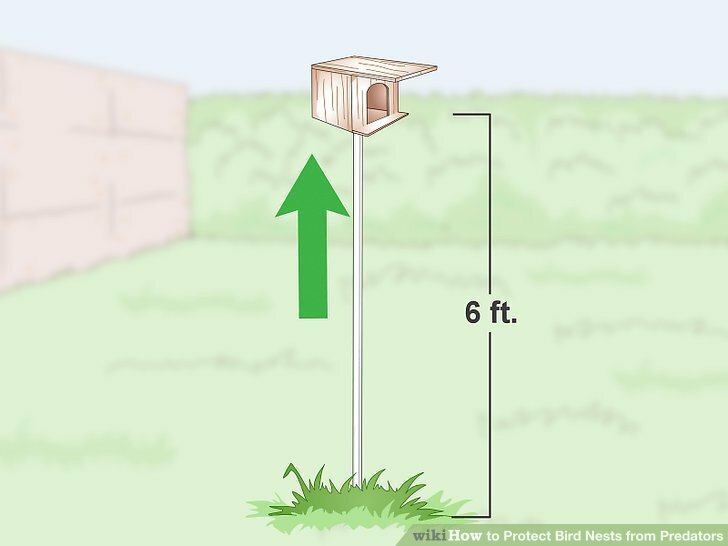 Ask the salesperson what boxes are suitable for the bird species in your backyard, as there may be one type that is more effective than another. 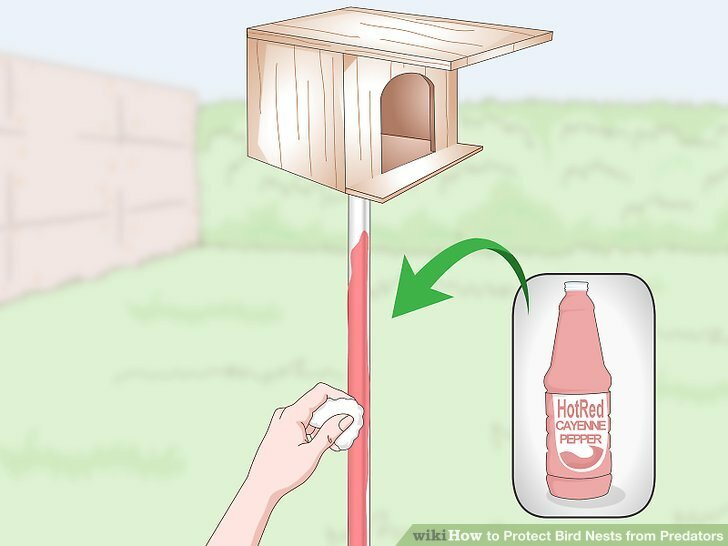 A nest box or birdhouse that is mounted to a pole in your garden can make a huge difference for the survival of the birds in the nest. When a nest is in a tree, there isn't much that you can do to protect it. 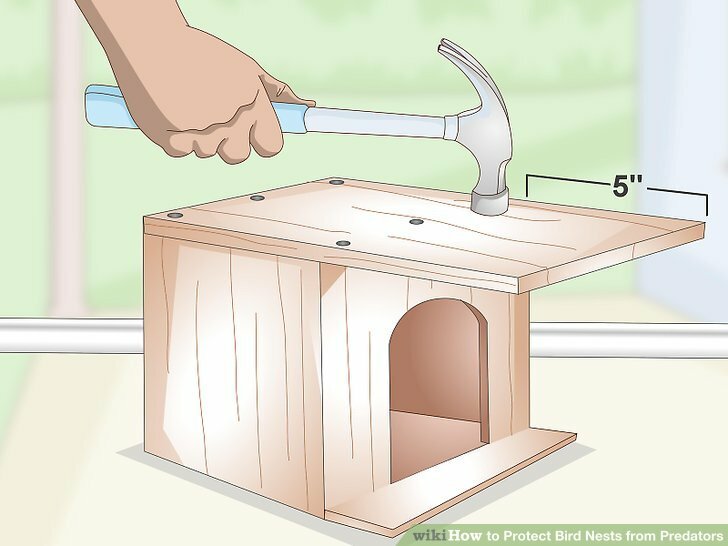 Install a roof that extends 5 in (13 cm) from the front of the nest box. When it’s not breeding season and the nest is empty, you can either extend the existing roof to make it bigger, or replace the roof with a larger one. This will prevent cats and racoons from being able to sit on the roof and reach into the nest box hole from above. Cats and racoons are intelligent creatures who will quickly learn that nest boxes can be a reliable source of food. This means that making access to the nest as difficult as possible for these animals is key. 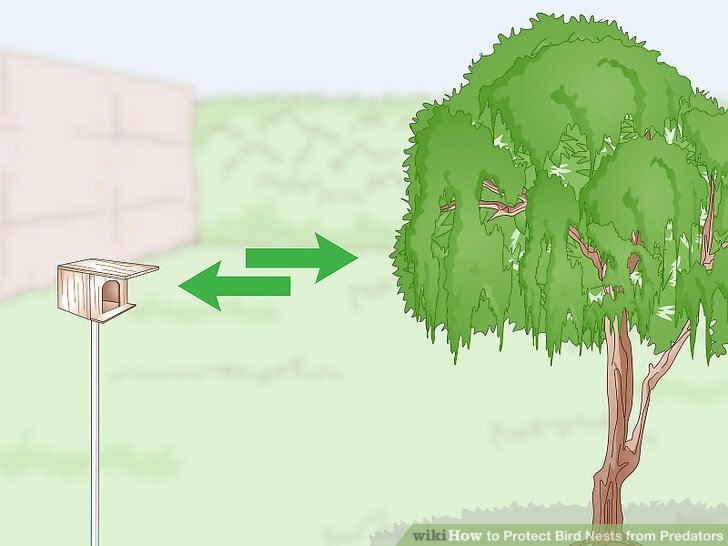 Place the nest box as far away from any large trees as possible. A nest box which is close to large trees makes it easy for cats to leap from a tree to the top of the nest box. 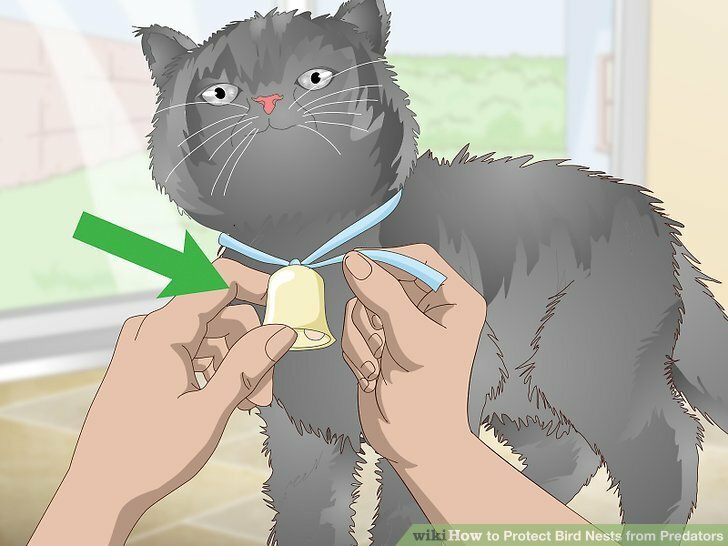 This will reduce the likelihood of any felines being able to reach the nest and predate on the birds. Nest boxes ideally should be placed at least (15 m) away from trees. Make sure that the nest box is at least (1.8 m) off the ground. Cats can generally jump up to 6 times their own height in a single leap, which means that a (30 cm) family feline can reach a nest (1.8 m) off the ground. This will also help to keep racoons out of the nest. Nest boxes that are (1.2 - 1.5 m) above the ground, or less, will become an easy target for predators that dwell on the ground. 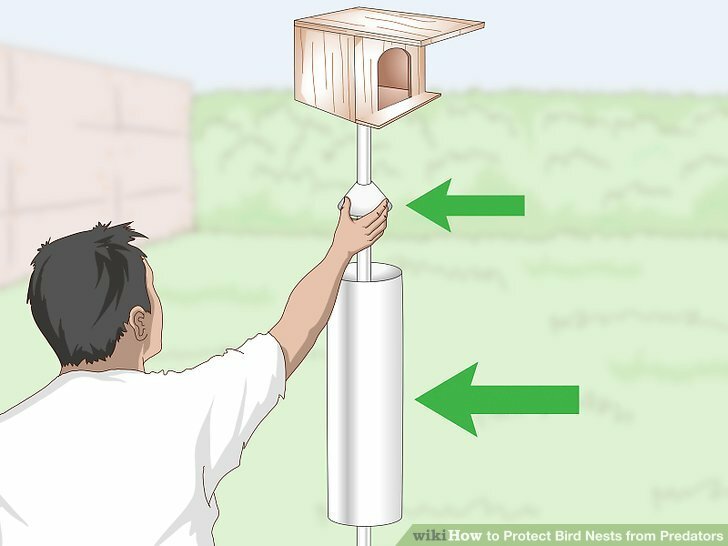 Attach a predator guard to the nest box pole. This will prevent cats and racoons from being able to climb the pole to reach the nest. A common design for predator guards is a conical metal collar which is attached convex to the nest box on the pole. A stovepipe baffle is another effective guard, which is a piece of pipe that encircles the pole and makes it very difficult to cross. There are a variety of different shapes, sizes, and designs of predator guards available from gardening and hardware stores. 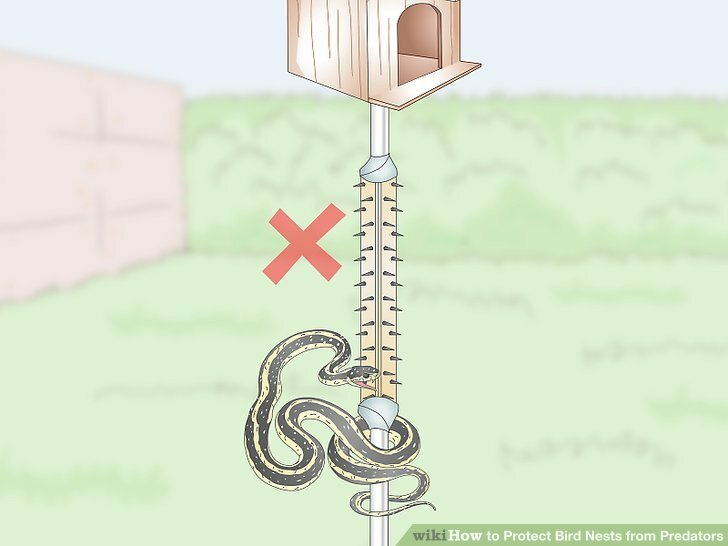 A stovepipe baffle will also help to prevent most snake species from reaching the nest, which makes it ideal to use if you are concerned about multiple predator species. Rub 1 cup of hot red cayenne pepper on the nest box pole. Give the pole a light dusting with the pepper to deter snakes from climbing the pole and reaching the nest box. 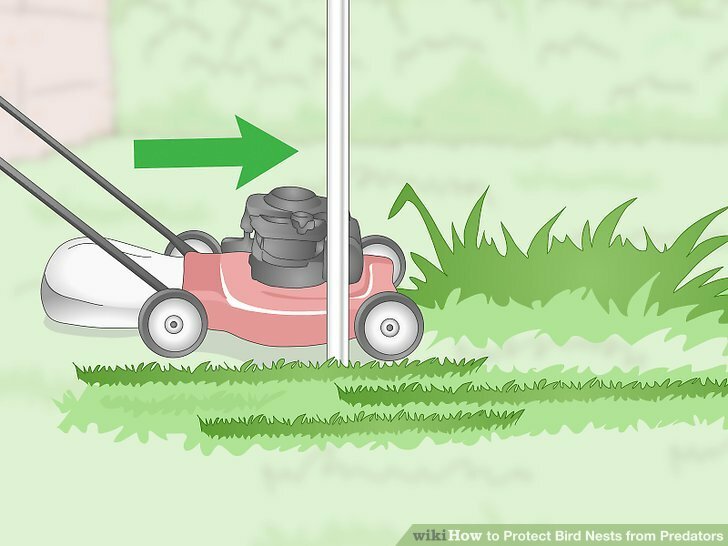 Do this 1 - 2 times per week throughout the breeding season, until the nest is empty. Cayenne pepper will also help to deter cats, squirrels, and bears, making it ideal if a wide variety of predators is the problem. Birds don’t have much of a sense of taste, and the cayenne pepper cannot harm them or their nest. Keep the vegetation around the pole trimmed and maintained. Snakes love long grass and thick cover to hide in, and this works especially well if this is around the pole to the nest box. Mow the lawn regularly and keep it free of weeds, to help keep snakes at bay. If snakes are a particular problem in your area, consider getting rid of the lawn and creating a circle of clean sand around that pole that is (30 cm) in diameter. Be very careful when checking the nesting box and surrounding area for snakes, especially while you are keeping the garden maintained. Most injuries in this situation come from getting a surprise from seeing a snake and falling over, rather than from the snake itself. Polish and clean the nest pole regularly. Use fine steel wool to rub over the pole regularly to remove any dirt. This is because any debris will make it easier for the snake to climb the pole, as there will be more friction. To test if it’s likely that snakes will be able to climb the pole or not, use a silk handkerchief to rub lightly over the pole. If the handkerchief snags on any debris, especially if it’s every 6 in (15 cm) or less, then it’s likely that a snake would easily be able to climb the pole. Use carpet tack strips to deter snakes. Use either nails or duct tape to secure carpet tack strips up the pole to deter snakes from climbing it. You could also use adjustable clamps to hold the carpet tack strips in place. Carpet tack strips are used to hold carpet in place, and are thin boards which are covered in small nails. Carpet tack strips should only be used as a last resort, when all other solutions for predation by snakes have been exhausted. This is because they could be dangerous to small children or family pets, so avoid using them if possible. Use vinegar and mint to deter insects. Insects rely mostly on smell to survive, and most will be deterred by the smell of vinegar and mint. 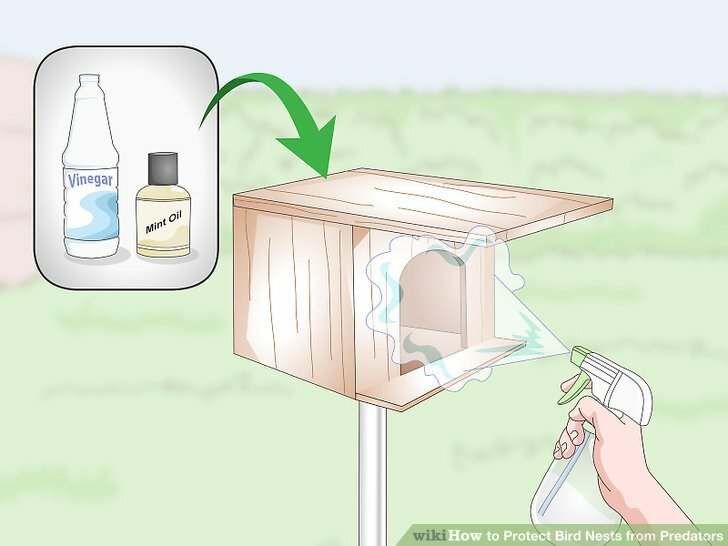 Spray mint oil or natural cider vinegar both in and around nest boxes while they are empty. Spray insecticides after the nesting season is over. Mites, fly larvae, and bird lice can all be eliminated by pyrethrin and rotenone insecticides. This will help to keep the nest box clean, and to discourage insect predators from hanging around. 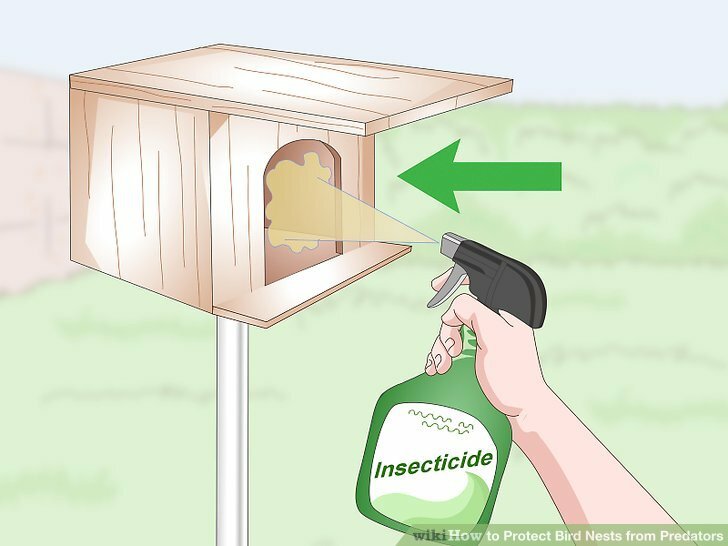 Never use insecticides either just before or while the birds are using the boxes, as the birds are very sensitive to chemicals and could easily be harmed. 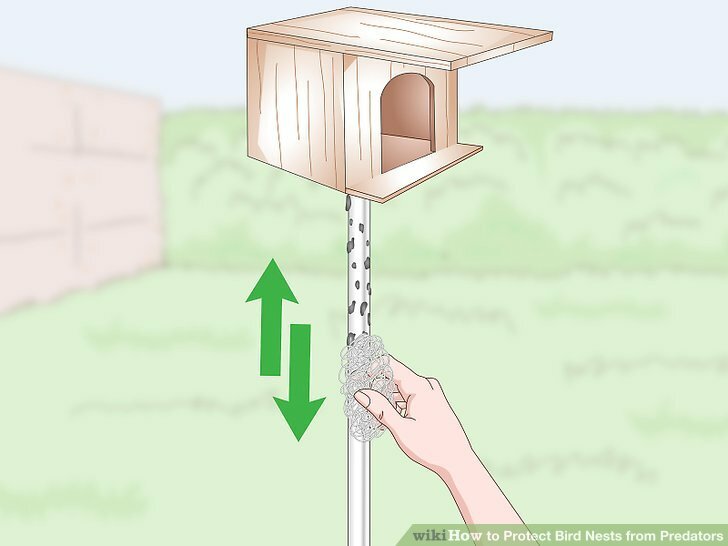 Leave the nest box in the sun to dry, and wait until it has completely dried before you put it back on the pole. 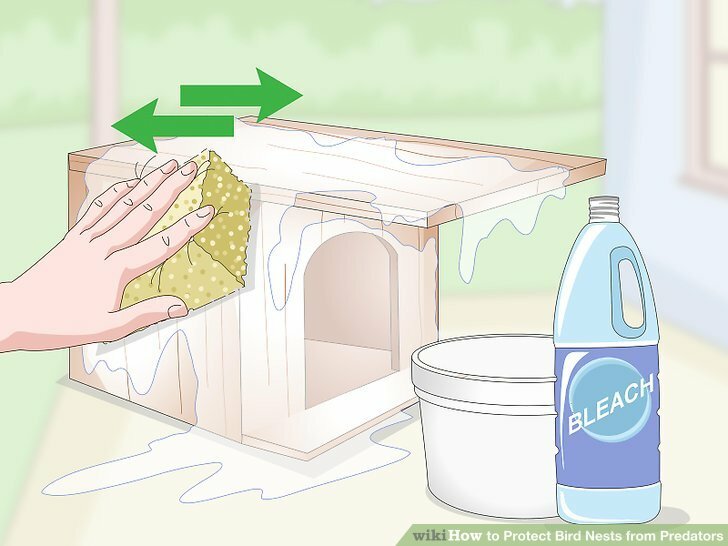 Coat the ceiling of the nest box with bar soap to deter wasps. Wasps like to make their nests inside bird nesting boxes, however a smooth, slightly slippery coating will prevent them from being able to. Cover the ceiling with a coating of soap, and extend it slightly down the walls too. An unscented bar soap with as few ingredients as possible is the best choice. Try not to get discouraged if predators do happen to get into the nest. It’s impossible to make the nest 100% safe from predators, so if the worst does happen, try out a different solution next time. Remember that native predators can also help birds, rather than being detrimental to them. While the native predator might consume a few birds nests per year, it will also hunt many more rodents, which would have otherwise preyed on the nests. Some bird species choose to nest near native predators because this gives them the protection from many smaller rodents, despite the obvious risk. Although petroleum jelly can be effective to to keep many insects away, never use this around birds as their feathers can get greasy and this will hinder their flight.